Magic Circle Mime Company is regarded as one of today’s premier family attractions. Their highly acclaimed performances, which unite the concert orchestra with visual theater, are consistently praised for imaginative and innovative content. Magic Circle Mime Company performs with virtually every major orchestra in North America and has performed on numerous occasions with the symphony orchestras of Atlanta, Detroit, Chicago, Montreal, Saint Louis, Seattle, Toronto, Vancouver and Winnipeg; the Cleveland Orchestra, Minnesota Orchestra and Philadelphia Orchestra; and on more than half a dozen occasions at The Kennedy Center For The Performing Arts with the National Symphony Orchestra. The 2018-2019 season marks their sixth appearance at Canada's National Arts Centre. Magic Circle Mime Company also has a growing reputation outside North America. The have performed at festivals and with major orchestras in Australia, China, Japan, Hong Kong, Malaysia, New Zealand, Singapore and Taiwan. Appearances include the Beijing Music Festival, Shanghai International Children's Festival, Taiwan International Children's Festival, Hong Kong Philharmonic Orchestra, Malaysian Philharmonic Orchestra, Tokyo Philharmonic, Taipei Symphony Orchestra, National Taiwan Symphony Orchestra, West Australia Symphony Orchestra and the Singapore Symphony Orchestra. They made their European debut with the Palau de la Música de Valencia in April of 2007 leading to return engagements in Spain in 2008, 2009, 2011 and 2013. In 2012 they performed in South America for the first time with Orquesta Filarmonica de Bogota. 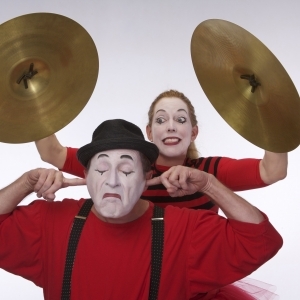 Magic Circle Mime Company is the creative partnership of Maggie Petersen and Douglas MacIntyre. Both artists have backgrounds in theatre and instrumental music, and have utilized that training to create their highly regarded programs. Their newest production, "Orchestra from Planet X," explores the many influences that helped create the music of the New World.